Hey that looks great! I'm happy they worked out for you. I see you used surface mount resistors and through-hole diodes. Any particular reason for the mix? How did the LEDs work out? In any case.. very nice! Thanks! I'd have done SMT diodes as well, but I didn't have any lying around (and I had SMT resistors and through-hole diodes...). Wow, so these are available for purchase? Or did you get prototypes from mtl? mtl shared the design on OSH Park, and it is super easy to order some from them (EU friendly, no hidden costs, bubble envelope marked for $10 regardless of the order). Also high quality (well except than one botched batch, but this is rare - I ordered quite a few things from them over the years with no problems). This project was intended to scratch an itch, learn something new and a fun challenge, so I never wanted to earn anything back from it. Thank you, though. I haven't ordered a large enough quantity to build a keyboard yet, primarily because I'm not yet sure how many I'll need. If there's sufficient interest in a group buy to get the price down, then I would be onboard and willing to organize. I'm in the US so the shipping and import duties abroad may offset any bulk discount, however. I received 6 boards the other day. I'm hoping to make it so that the switch and wires are removable, no soldering. So far I have a good pin connector that allows the switch to be removable from the board. There is even a smaller one they'll work for the leds. For the wires I thought about taking apart terminal blocks and using that to connect the wires, but the pins are to big to fit into the board. Now i'm playing with header pins, if I remove the plastic and solder them to the board, it might be a good option just have to sacrifice a bit of height to make it work. Just curious if you guys have any ideas about going this route. I have many things planned, want to 3d print the top panels and case. Was planning on using a joystick for mouse movement, even a rotary encoder to create a scroll wheel. Other things I want to do is add a layer that can be user programmed, usb hub embedded and if possible bluetooth. Want to build the thing in phases, but for now I want a 2x2 matrix with the joystick then move up from there. Hey all, sorry for the necro, but I didn't see any recent posts about this. 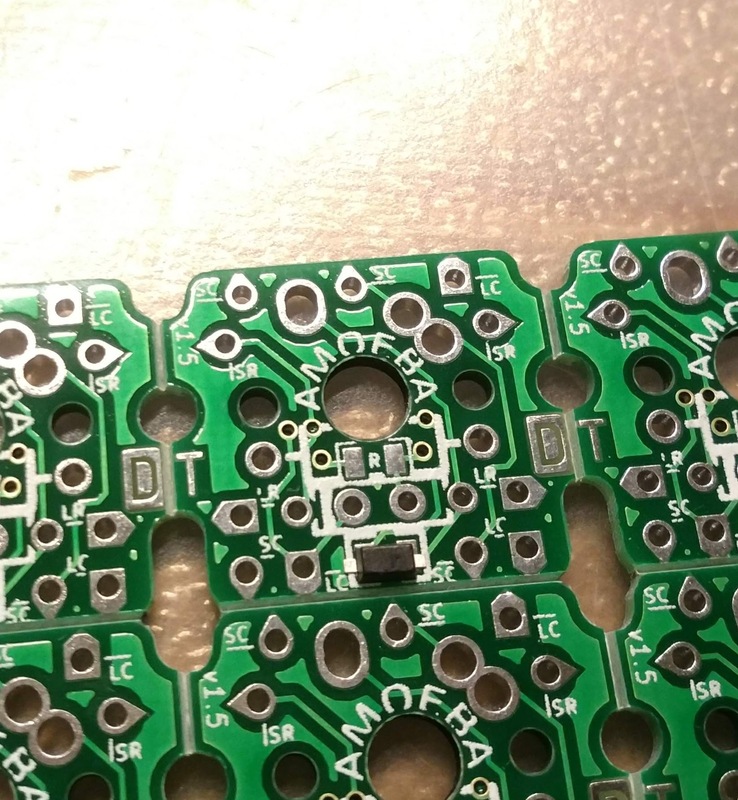 I have recently built a board using the Amoebas, but I am stuck on finding a non-frustrating way to create the tiny bridge wires. I'm having trouble stripping the ends and preventing them from getting bent out of shape because the sections are so small. This is a big board (124 switches), so I'd rather find a repeatable workflow to save myself the headache. dasGnome wrote: ↑ Hey all, sorry for the necro, but I didn't see any recent posts about this. Have you tried magnet wire? The enamel melts off the wire when you touch it with a soldering iron thus allowing the solder to flow onto it. I have been using regular 34 awg hookup wire. This was also suggested on reddit, so I've ordered a bunch to try it out. Thanks for the tip. 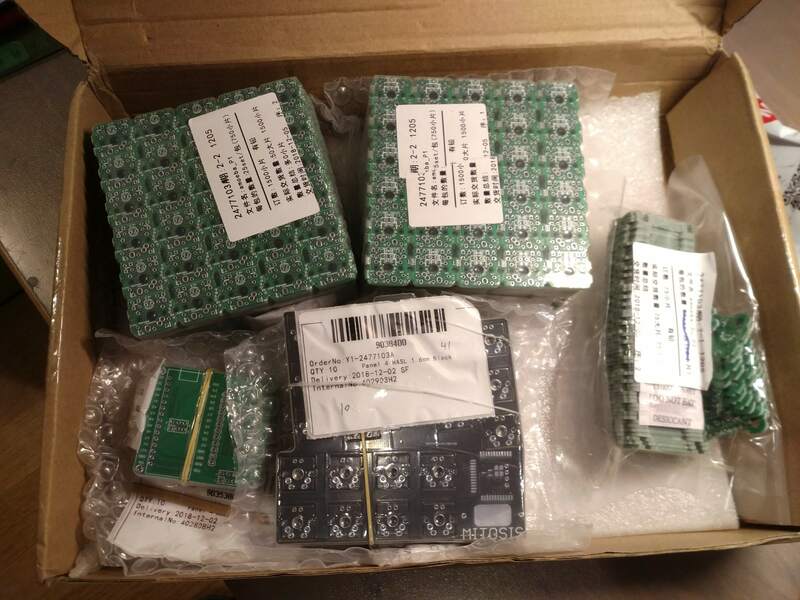 I've organised a small groupbuy for Amoeba 1U and 2U PCBs from JLCPCB. There were 1500 Amoeba 1U PCBs on 50 5x6 panels ($33.47), 75 Amoeba 2U ($11.02), 10 Mitosis PCBs ($17.00) and 10 Lobot PCBs ($4.60). Shipping cost was $45.33. Is there a gerber file for those 5x6 panels? Or how do I order a panel of the amoeba switches? The Amoeba is available in 5×6 also from Keebio. I was a bit disappointed when I saw that there is 1u spacing only on the horizontal, not on the vertical. The rows will have to be broken apart. You can organize a group buy if you have a local PCB manufacturer. About 3 month ago producing 1500 Amoebas (50 5x6 panels) at Chinese jlcpcb.com was about $75 including shipping, cheaper than producing them locally (in Moscow), but I didn't have to pay a customs fee. With jlcpcb I just had to select panelized production and choose X by Y size.